ABC is getting into the spirit with Charlie Brown and the Toy Story gang this October! “It’s the Great Pumpkin, Charlie Brown” — The classic animated Halloween-themed PEANUTS special, “It’s the Great Pumpkin, Charlie Brown” (OAD on ABC 10/30/01), created by late cartoonist Charles M. Schulz, as well as a bonus PEANUTS cartoon, “You’re Not Elected, Charlie Brown,” in which Linus runs for class president. The program will air with Spanish audio via SAP. 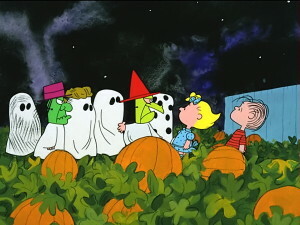 In the 1966 animated special “It’s The Great Pumpkin, Charlie Brown,” The PEANUTS gang celebrates Halloween with Linus, hoping that finally, he will be visited by The Great Pumpkin, while Charlie Brown is invited to a Halloween party. Cast members include Peter Robbins (Charlie Brown) and Christopher Shea (Linus). The cast also includes Sally Dryer as Lucy, Chris Doran as Schroeder, Bill Melendez as Snoopy, Kathy Steinberg as Sally, Tracy Stratford as Violet and Ann Altieri as Frieda. “Toy Story Of TERROR!” – Disney·Pixar’s first special for television, “Toy Story OF TERROR!,” a spooky new tale featuring all of your favorite characters from the “Toy Story” films. What starts out as a fun road trip for the “Toy Story” gang takes an unexpected turn for the worse when the trip detours to a roadside motel. After one of the toys goes missing, the others find themselves caught up in a mysterious sequence of events that must be solved before they all suffer the same fate in this “Toy Story OF TERROR!” The cast of “Toy Story OF TERROR!” includes Tom Hanks as Woody, Tim Allen as Buzz, Joan Cusack as Jessie, Carl Weathers as Combat Carl/Combat Carl Jr., Timothy Dalton as Mr. Pricklepants, Don Rickles as Mr. Potato Head, Wallace Shawn as Rex and Kristen Schaal as Trixie. An encore presentation of “It’s the Great Pumpkin, Charlie Brown” will air.